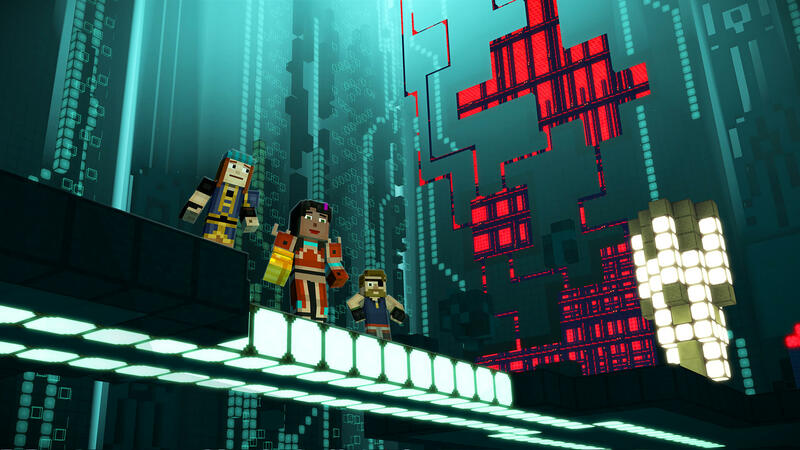 Nearly six months ago, the first episode of Minecraft: Story Mode – Season Two released. Jesse's story carried on from the first season as he/she met new friends, went on exciting new adventures and came face to face with strong, fearless enemies. It was all about to come to a head in this final episode, so just how would Jesse and friends defeat the Admin once and for all? How exactly do you defeat the Admin? We left Jesse and friends at the end of the last episode as they'd managed to make their way back to Beacontown. After sneaking into the town through some tunnels, we then get a real look at what has happened to Beacontown and see what it had been turned into by the Admin posing as Jesse. Even in block form, the town still manages to look run down and almost abandoned, a shell of what it used to be like. This is reflected in the especially dullen look of this episode, with the darkened skies, colours and streets. Once inside Beacontown, your aim is to get to the primary terminal to enter the word of passage. In order to get there, you are given a number of different choices along the way that may help or hinder you depending on what you pick. The game offers you lots of chances to make decisions that, whilst they may not affect the ultimate outcome of the episode, will determine how the other characters in the game react to you. This gives you the choice of whether you can trust old and new friends with what you decide to do. Aside from these smaller choices scattered about the episode, you also have some big decisions to make when it gets to the end of the episode too. No matter what you've done earlier in the episode or the season, these choices stand alone and can be made however you see fit. The ultimate last decision you make will decide how the episode ends, and either choice rounds things off nicely while still leaving the story open for potentially more episodes, as the first season ended up having. This episode is another that is quite short compared to other episodes in the season, but it still ends up being largely focused on conversation. For the rest of the time, you have the expected bit of wandering about, combined with a bit of crafting and also a little bit of puzzle solving. A puzzle towards the end of the episode might cause you a little bit of a problem as you aren't really given much help, but this offers a nice change from the conversation filling the rest of the episode. With this being the finale, you'd be expecting some kind of boss fight to occur and you'd be right. The boss fight does not disappoint for the large part, taking place across a number of different locations with the boss having a handful of different forms as well. It's an impressive boss fight and while the game does tease you for a little while that there may not be any fight at all, it is an enjoyable one that only has one outcome. Another thing that this episode does well is to tie up some of the loose ends from previous episodes. Old friends that have made appearances in other episodes reappear and allow their stories to tie up, and people that you may have lost or left behind along the way also have their stories finished off. This is a nice touch and the episode perfectly brings everything together, which makes it feel like the ideal finale it is aiming to be. Finally, the six achievements of the episode will unlock with natural progression through the story, offering the expected 200 gamerscore upon completion. 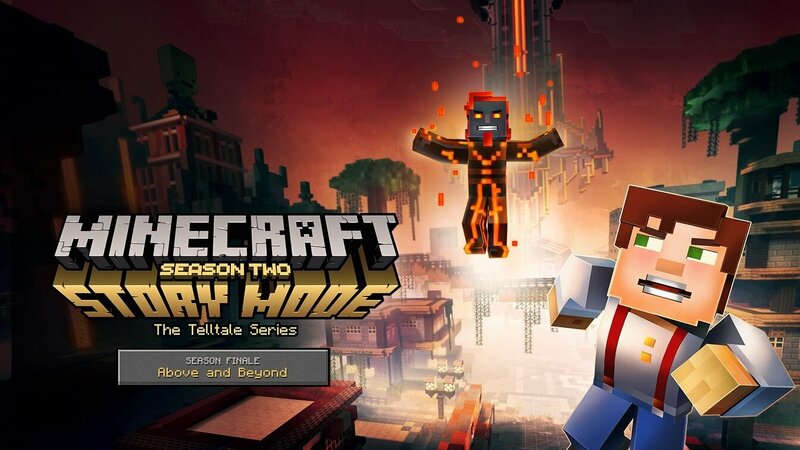 “Episode 5 – Above and Beyond” is an appropriate end to another good Telltale season. The episode does a brilliant job of bringing everything together and tying up a number of loose ends across the season. The episode is scattered with important choices and either choice at the end offers closure for the gamer. Aside from the episode feeling a little short, there's not a lot wrong here. It may not be non-stop action, or blow you completely away, but it is a solid end to an enjoyable season.